In 2002, four southwestern Pennsylvania foundations formed a limited partnership with RIDC, a non-profit development organization as general partner, and purchased the 178-acres LTV Steel Hazelwood site. 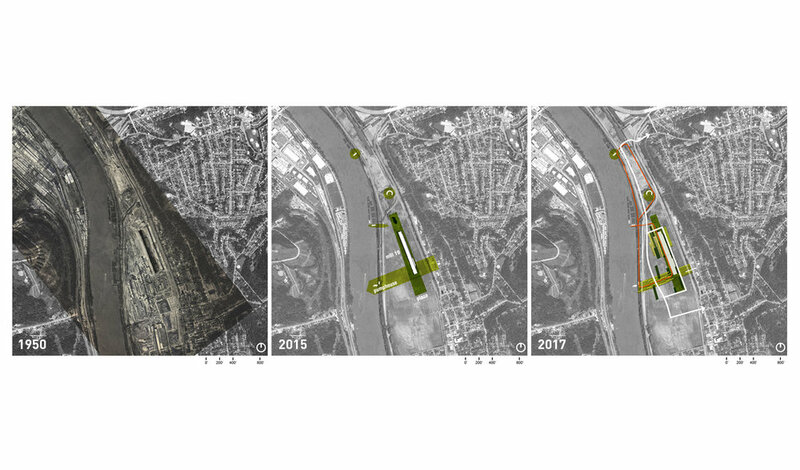 This remarkable plateau along the Monongahela River, just south of downtown Pittsburgh is a rare opportunity to set a new standard for urban riverfront property development. The partnership is called Almono and the partners envision a master-planned development that maximizes local and regional impact, as well as employing development and economic best practices. Environmental sustainability, including alternative sources of energy, storm and waste water management and transportation innovation are key components of the plan. The expansive site offers the opportunity to filter and collect the immense volume of water from the site and new buildings. A large stormwater filtration garden is nested along the west side of the Mill and provides an opportunity to blur the relationship between inside and outside, as well as showcase biotechnologies interwoven between the landscape and the Mill to visibly set the bar for the sustainable goals of the masterplan. Nested within the armature of the former steel mill, the mammoth steel structure becomes legibly grounded to the site, revealing the rich history and regenerative future of this place while providing new landscapes made from remnants of this site. Firmly grounded in an understanding of the metrics of the project’s challenges (soil contamination, progressive sustainability goals, economic growth generation to maximize impact, activation of the site for workers and the adjacent community, and preservation of industrial heritage within a very tight construction budget ), the Mill 19 design lays the groundwork for a new type of regional economic hub that celebrates Pittsburgh’s tough industrial legacy, instigates growth and renewal, and reconnects the community to one of the region’s most beautiful assets – the Monongahela River.